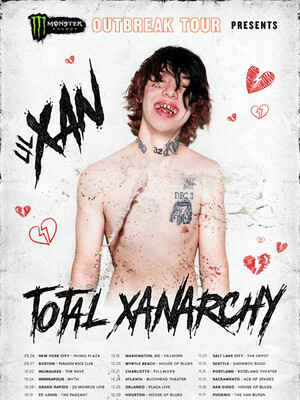 Lil Xan takes debut album Total Xanarchy on tour! American rapper Diego Leonos, known as Lil Xan, is hitting the road on his headline tour; The Monster Energy Breakout Tour. The tour is in support of his highly anticipated debut album "Total Xanarchy", which features hits such as 'Slingshot', 'Wake Up' and his platinum-certified hit 'Betrayed' which peaked at #64 on the Billboard Hot 100 charts. 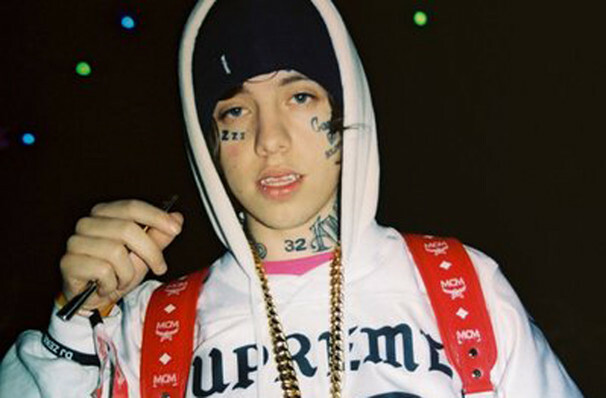 Lil Xan's music started off as sounding like 'typical trap', but soon shifted up a gear and is now said to be 'dream-like'! The 21 year olds music takes inspiration from Drake and Mac Miller, but also contains hip-hop influences from the likes of N.E.R.D and Pharrell Williams. Sound good to you? Share this page on social media and let your friends know about Lil Xan at Bogarts. Please note: The term Bogarts and/or Lil Xan as well as all associated graphics, logos, and/or other trademarks, tradenames or copyrights are the property of the Bogarts and/or Lil Xan and are used herein for factual descriptive purposes only. We are in no way associated with or authorized by the Bogarts and/or Lil Xan and neither that entity nor any of its affiliates have licensed or endorsed us to sell tickets, goods and or services in conjunction with their events.